Mars, the fourth planet from the Sun, was named for the Roman god of war. It is a barren, desolate, crater-covered world prone to frequent, violent dust storms. It has little oxygen, no liquid water, and ultraviolet radiation that would kill any known life-form. Temperatures range from about 80°F (27°C) at midday to about −100°F (−73°C) at midnight. Because of its striking red appearance in the sky, Mars is known as the "red planet." Mars is roughly 140 million miles (225 million kilometers) away from the Sun. It has a diameter of 4,200 miles (6,800 kilometers), just over half the diameter of Earth. Its rotation on its axis is slightly longer than one Earth day. Since it takes Mars 687 (Earth) days to orbit the Sun, its seasons are about twice as long as those on Earth. Mars has numerous Earthlike features. The two distinguishing features mark the planet's northern hemisphere. 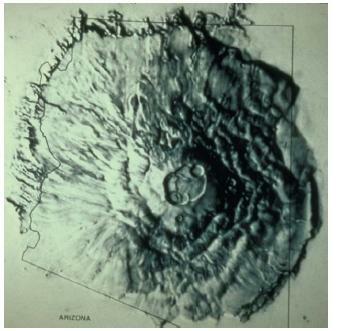 The first is a 15-mile-high (24-kilometer-high) volcano called Olympus Mons. Measuring 375 miles (600 kilometers) across, it is larger than any other in the solar system. The second is a 2,500-mile-long (4,000-kilometer-long) canyon called Valle Marineris, eleven-and-a-half times as long and twice as deep as the Grand Canyon. The southern hemisphere is noteworthy for Hellas, an ancient canyon that was long ago filled with lava and is now a large, light area covered with dust. Mars is also marked by what appear to be dried riverbeds and flash-flood channels. These features could mean that ice below the surface melts and is brought above ground by occasional volcanic activity. The water may temporarily flood the landscape before boiling away in the low atmospheric pressure. Another theory is that these eroded areas could be left over from a warmer, wetter period in Martian history. Mars has two polar caps. The northern one is larger and colder than the southern. Two small moons, Phobos and Deimos, orbit the planet. Beginning in the early 1960s, both the former Soviet Union and the United States sent unmanned spacecraft to Mars in an attempt to learn more about the planet. Although some of those missions were unsuccessful, others were able to transmit data back to Earth. In 1965, the U.S. probe Mariner 4 flew past Mars, sending back 22 pictures of the planet's cratered surface. It also revealed that Mars has a thin atmosphere composed mostly of carbon dioxide and that the atmospheric pressure at the surface of Mars is less than 1 percent of that on Earth. The 1969 fly-by flights of Mariner 6 and Mariner 7 produced 201 new images of Mars, as well as more detailed measurements of the structure and composition of its atmosphere and surface. From these measurements, scientists determined that the polar ice caps are made of haze, dry ice, and clouds. Two years later, Mariner 9 became the first spacecraft to orbit Mars. During its year in orbit, Mariner 9 's two television cameras sent back pictures of an intense Martian dust storm as well as images of 90 percent of the planet's surface and the two Martian moons. It observed an older, cratered surface on Mars's southern hemisphere and younger surface features on the northern hemisphere. Viking probes. In 1976, the United States launched the Viking 1 and Viking 2 space probes. Each Viking spacecraft consisted of both an orbiter and a lander. Viking 1 made the first successful soft landing on Mars on July 20, 1976. A soft landing is one in which the spacecraft is intact and functional on landing. Soon after, Viking 2 landed on the other side of the planet. 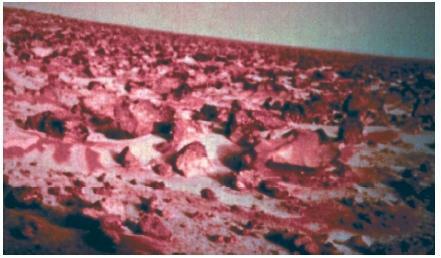 Cameras from both landers showed rust-colored rocks and boulders with a reddish sky above. The rust color is due to the presence of iron oxide in the Martian soil. The Viking orbiters sent back weather reports and pictures of almost the entire surface of the planet. They found that although the Martian atmosphere contains low levels of nitrogen, oxygen, carbon, and argon, it is made primarily of carbon dioxide and thus cannot support human life. The soil samples collected by the landers show no sign of past or present life on the planet. In August 1996, scientists announced they had found possible traces of early Martian life in a potato-sized igneous rock. The small meteorite had been flung into space by the impact of a huge asteroid or comet 15 million years ago. It then wandered about space until it fell on the Antarctic ice sheet about 13,000 years ago. Geologists discovered the meteorite (along with more than a dozen others) in buried ice in 1984. Upon examining the rock, scientists found what they believe are fossilized remains of microorganisms that might have existed on Mars during an early part of its history when it was warmer and wetter. In 1996, the National Aeronautics and Space Administration (NASA) marked a new era in exploration when it began a ten-year campaign to explore various regions of Mars. The goal of the campaign is to discover whether life in any form ever existed—or still exists—on the red planet. Mars Global Surveyor . The campaign began with the launch of the Mars Global Surveyor on November 7, 1996. The Surveyor established an orbit 250 miles (400 kilometers) above the surface of the planet in September 1997. The spacecraft's two-year mission was to map systematically the surface of the planet. To do so, it used a laser altimeter to map mountains and valleys; a camera system to record land forms and clouds; and detectors to measure atmospheric composition, radiation, and surface minerals. The Surveyor 's first major discovery was to solve one of the greatest mysteries surrounding Mars: the planet does possess a magnetic field. A magnetic field is usually generated by molten metal at a planet's core. On the surface, the field shields a planet and life on it from cosmic and solar radiation. Although Mars's field is weak, its existence adds evidence to the possibility that life may have existed on the planet long ago. In April 1999, the Surveyor sent back to Earth some astonishing information: the crust of Mars's surface has alternating layers of magnetic fields. Scientists theorize that the magnetic bands are formed when magma from far below the surface of Mars is forced to the surface by plate tectonics. (Plate tectonics is a geological theory that Earth's surface is composed of rigid plates or sections that move about the surface in response to internal pressure.) As the magma cools and hardens into a new layer of crust, the iron in the magma is magnetized towards the current magnetic field. This discovery could point to a past of geologic activity similar to that of the Earth and possibly very early on in its history supported simple life forms. In June 2000, scientists studying pictures sent back by Surveyor announced that the standard description of Mars as cold, desolate, and dry would have to be changed. The pictures clearly showed channels and grooves on the steep, inside walls of craters that indicate the downward flow of water. These surface features appear to be evidence of water in the upper crust of Mars that had seeped through and run down the channels. Scientists suggested that these water flows happened in recent geological time—perhaps just a few hundreds, thousands, or millions of years ago. warmer world with a denser atmosphere, and its surface was covered with lakes and shallow seas. They based these assumptions on evidence of distinct, thick layers of rock within craters and other depressions on the surface of the planet. After having gathered tens of thousands of images of Mars, the Mars Global Surveyor completed its mapping mission in early 2001. Its main mission accomplished, the probe was given additional scientific work to complete, including scouting out landing sites for future spacecraft. NASA engineers hope to use Surveyor to relay commands to twin rovers slated to land on the planet in early 2004. Mars Pathfinder and the Sojourner rover. On December 4, 1996, less than a month after the launch of the Mars Global Surveyor, NASA launched the Mars Pathfinder. Six months later, on July 4, 1997, the Mars Pathfinder landed successfully on Mars in the plain of Ares Vallis and released the Sojourner rover. From pictures sent back by the Mars Pathfinder, scientists deduced the plain where the spacecraft landed had once been reshaped by colossal floods. The tilt of rocks and the tails of debris behind pebbles in the area led scientists to estimate that the main flood was hundreds of miles wide, hundreds of feet deep, and flowed for thousands of miles. Scientists could not answer the question of where the water went. Part of the mission of the rover was to record the chemical makeup of rocks and the soil. The instruments on Sojourner revealed that Mars has a history of repeated cycles of internal melting, cooling, and remelting. The rocks analyzed contained large amounts of the mineral quartz, which is produced when the material is melted and remelted many times. Sojourner's examination also revealed that Mars seems much more like Earth geologically than the Moon does. The Martian rocks analyzed resemble a common Earth volcanic rock named andesite. These findings support scientific theories that Mars has been convulsed (literally turned inside out) by internal heat through much of its 4.6-billion-year history. Lost missions. In 1999, NASA suffered a double blow when two spacecraft, each on a mission to Mars, were lost. 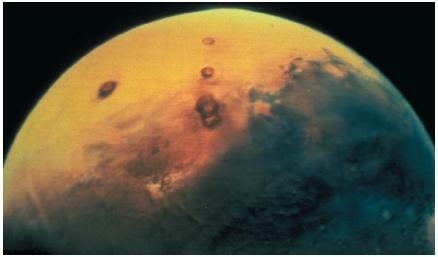 In September of that year, the Mars Climate Orbiter was to have reached Mars, settled into an orbit, explored the Martian atmosphere, and acted as a communications relay station. However, because technicians failed to convert metric and English measurements in navigational instructions sent to the spacecraft, it flew in too close to the planet and most likely burned in the atmosphere before crashing. It was never heard from again. Just three months later, in December, the Mars Polar Lander was scheduled to have landed on Mars to begin prospecting the landscape of dirt and ice for traces of water and evidence of the planet's climatic history. However, scientists for the project never heard from the 1,200-pound (545-kilogram) robotic spacecraft after it was supposed to have landed. They speculate that a software glitch in the spacecraft's program caused it to crash just moments before its projected landing. Future expeditions. In October 2000, NASA unveiled an ambitious plan to send eight or more probes to Mars over the next two decades to search for evidence of water or life. The first of these, Mars Odyssey, was launched in the spring of 2001, with a planned arrival in the fall. Once in orbit, the spacecraft will try to determine the composition of the planet's surface, to detect water and shallow buried ice, and to study the radiation environment. In mid-2003, in a mission planned by the European Space Agency and the Italian Space Agency, NASA will launch the Mars Express. This spacecraft's main mission will be to search for subsurface water from orbit and to deliver a lander to the Martian surface. That lander, the Beagle 2 , will sniff air, dig dirt, and bake rock samples for evidence of past or present life. Also in 2003, NASA will send two powerful rovers to Mars that will be identical to each other, but will land at different regions of the planet. These robotic explorers will be able to trek up to 328 feet (100 meters) across the Martian surface each day in search of evidence of liquid water that may have been present in the planet's past. In 2005, NASA plans to launch a powerful scientific orbiter, the Mars Reconnaissance Orbiter. The orbiter will map the Martian surface with an eagle-eyed camera, trying to bridge the gap between surface observations and measurements taken from orbit. The camera will have an unprecedented 8-inch (20-centimeter) resolution, allowing it to record features as small as a license plate. In 2007, NASA plans to launch a roving long-range, long-duration science laboratory that will provide extensive surface measurements and pave the way for a future sample return mission. Perhaps the H2O disassociated? And if Mars is Earthlike, would they be volcanic tubes waiting to be discovered? Like the ones on the Moon? i need more help on this now! I'm working on a school project and im doing mars. help me now! Perhaps we could somehow terroform the planet. We could take plants thier and they can convert the carbon dioxide into oxygen.